Hello! 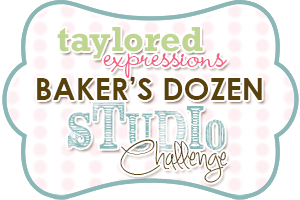 It's time for the February Taylored Expressions Baker's Dozen Studio Challenge. This is a monthly opportunity for us to share what makes our stamping studios hum. Each month we have a fun, crafty question so we can share our favorites, some tips and tricks, stamping advice and more. Recipe for success! 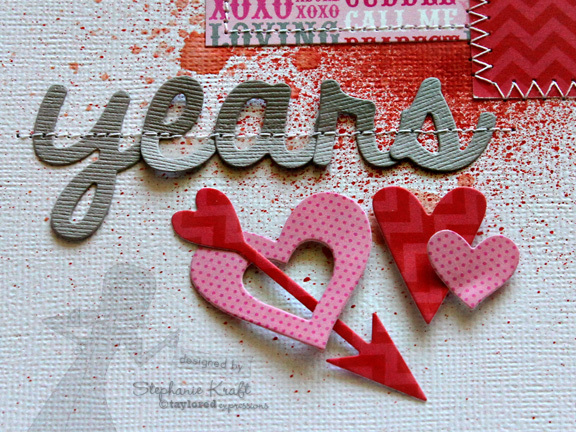 When you sit down to create a card just for fun, for the pure joy of stamping, without any type of assignment or deadline, what steps do you usually take? Tell us how you get started and take us along on your creative journey. 1) Decide on a theme or a story that I want to tell. 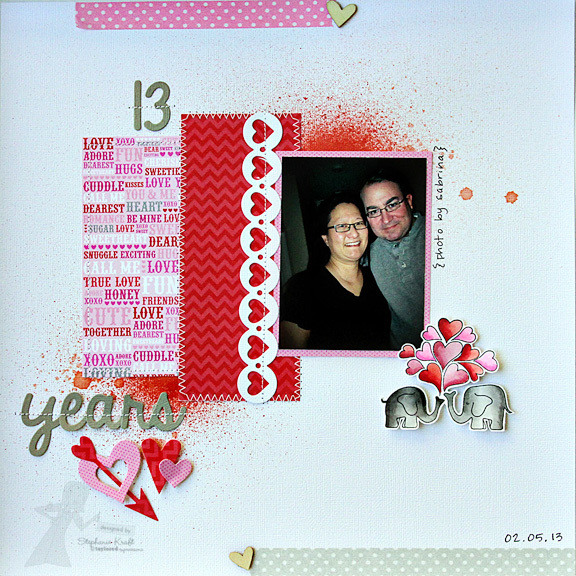 Dan and I celebrated our 13th anniversary earlier this month, so I decided to make a layout commemorating our 13 years. 2) Select photo(s). Since I tend to be the one taking the photos the most, I am often not in them (though I've started using the self-timer and handing off the camera from time to time). Sabrina also loves to take pictures, so this time I had her take a few photos of us on our anniversary. 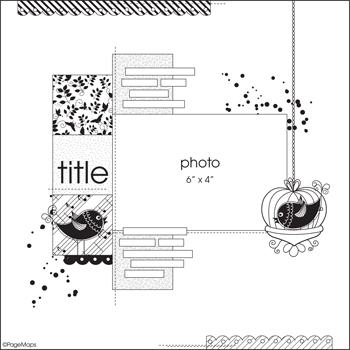 4) Select patterned papers and stamps (if using). I decided to use a sheet of white cardstock for my base and patterned papers from Doodlebug Lovebirds. 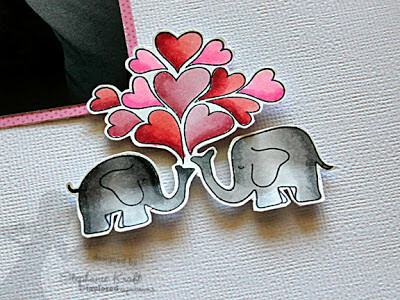 I don't always use stamps when I make a layout, but this time, I knew that I wanted to use Animals in Love - Elephants. 5) Crop and print photo(s). In this case I only had one photo. Although the photo in the sketch is 6x4, my photo was better as a portrait (orientation), so I cropped it to 3x5. This is also when I edit the photo and clean it up in Photoshop. Once I'm satisfied with my photo(s), I print them. Accessories: Taylored Dies: Whimsy Alpha, Whimsy #’s, Cupid’s Arrows, Jumbo Heart Border (Taylored Expressions); Markers (Copic), Grey and Cupcake Swiss Dot washi tape (Doodlebug), Mr. Huey’s Cameo and Overdue mists, Wood veneer hearts (Studio Calico); Foam tape, Thread, Sewing machine. The way you transalted that layoit into your beautiful page is just amazing! WOW! Happy 13th anniversary! Loved reading about your process with your scrap page, your layout is perfect and I love the elephants! Sabrina did a wonderful job taking your picture too! Hugs! Such a sweet layout Stephanie! Great photo of you and Dan! Congratulations! Great reason to celebrate! Great layout, congrats on 13 years! I keep buying supplies to scrap but make cards! I need to follow your lead and try to do more. What a fabulous page, Stephanie! Just beautiful! Amazing Stephanie! I love it! I wish I could sew so that I could copy your idea to sew my letters onto my pages...love that! This is such a gorgeous layout. I'm always so impressed and inspired by your creative scrapbooking. STUNNING! !